SE-X Driver Design, by maximizing and unleashing the very best potential of a single powerful 12AX7 tube to command and control the output tubes in the most effective manner (in single ended / SRPP mode), the key lies in the preciseness, accuracy and efficiency to achieve this simple-best approach design (it can't be done on other tubes because they don't have as high gain ability). We very much appreciate the sound result from this, than using a 2-stage design that is needed on most other pre-amp tubes such as 6H30 / 6922 / 5687 and so on. It will have more phase shift, more roll offs, less natural, more distortions, and you name it. Class A 8W (Max) / Block The amps are tuned for refinement over raw power, it's more useful and solid than you think. The most popular direct heated triode tubes of all time! It's not easy to master the beauty it of it - circuitry wise, although it seem easy to construct, but it is hard to master. It IS expensive to unleash its potential, on the hardware side. And that is why most 300B amps on the market either fail in this regard or or measured far from the best, because they had to work within a specific budget. Unfortunately, there is no way around quality with budget, at least with tube amps. 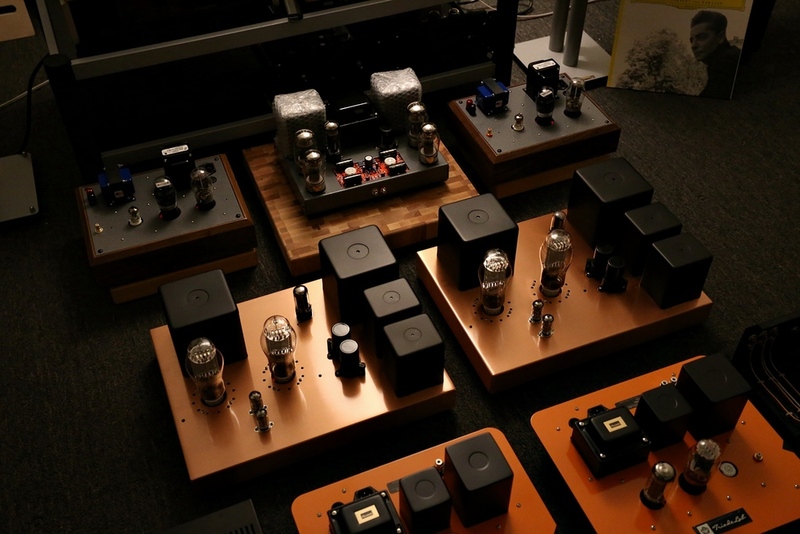 So, high quality tube amps, especially triode tube amps, are supposed to be expensive. The first thing in getting it right is the output transformers, without a good quality and properly-made pair by a HiFi transformers manufacturer, the 300B will not sing and unleash its potential. You can get away with other tubes, but not 300B. Here, a high-quality pair of Canadian made to our specifications are used (P-10), it is specifically designed for triode tubes such as 2A3/300B and 45. It is often designed for high fidelity, single-ended, Class-A, with frequency response at least 20 hz to 20 khz. We don't just focus on the outputs, even the choke transformer we pick are of high quality (made by Hammonds Canada) and important to both the sound and circuitry. Each of them is HIPOT tested (100%) at 1,500 VAC, and each of them is vacuum-impregnated with polyurethane varnish to yield for quietness and long life operations. For the power transformer, it's even more serious - again, made in Canada with conservative designs (that is reliable and able to provide seamless power deliveries) - CSA certified and made with high quality specs such as passing HIPOT test of 2,000V RMS, and made with Class A insulation (105 degree C) and so on. All these transformers are not just used because they are good, it also has to do with reliability and safety that we care very much about. MSRP :$3,500 USD / Pair. Signature Package $750 USD : Hashimoto Output Transformers (Remapped the circuitry to maximal the use with the uber Hashimoto, because every make and model of different transformers has different curves, insert loss, phase shift, and so on. Expect even better output power, distortion figures, inductance/weight, and perfecting curves!) / Mundorf Silver in Oil Caps / Cardas or CMC Binding Posts/ Furutech Japan Gold IEC AC Inlets ... etc. 16W-18W Class A Output Power The same good sound signature of above but double the power, Autobias as well. The Monza will be construct with big Hammonds transformers, specific for Parellel 300Bs. The RSR Drivers , the Monza will source using our 300B Flagships RSR amp’s driver directly. DC Filament Supply , also Direct Coupling for quiet, stable and most linear playback. Each 300B tube will be feed by its own individual filament transformers , power supply and own circuit board for the best seperation , performance and channeling ability. Making 5 transformers per block! Petite Sized - We will be borrowing the Triode Lab EL84II FFX Chassis , to making the most compact and fit 300B Parallel SET Mono Blocks on the market! Only measured 8”x17”. Description : While the standard Monza is already the best quality in the world, here, we bring the 300B Parallel design to further push the "cost-is-no-object" territory. And we are happy to announce its design a success. The 300B flagship output transformers also tested better than anything we have used/measured - hats off to Hashimoto Transformers (aka Sansui of Tokyo). We had quite an interesting and different opinion when came to the design table on these specific output transformers. At last, we mutually agree upon on one set of engineering parameters that makes this the best or nothing. The engineering of the Monza RSR mono blocks is totally different; almost everything is doubling up or separated half for better channeling / supply / and delivery. There are also two pre-amp tubes on each channel versus one (12AX7) on the standard Monza, two external main power supply E-Caps on the the RSR , dual up use of two choke transformers to quiet up further, same as the high-end noiseless reference grade power transformer that is made to last forever (like many Sansui products from over 50 years ago) , not to mention, all the passive capacitors and parts are more, bigger or better. The front end design is one of our best, and powerful enough we might use the same design to drive bigger tubes such as 845 / 211. Like the Monza, we use one 12AX7 for the most direct sound reproduction with fewest sound change / phase shift, we adapted one more 12BH7 or ECC99 to act as cathode follower and input impedance matching. The front end uses highest grade 1% brand name resistors, and each 300B's power supply and DC heating stage is separately constructed, they are considered to be quite "beefed up" compared to the standard Monza. We take the power supply design very seriously with no hold barred fashion on the RS-R, and its technical design level to our top level. The enhanced and true high-end quality tube power transformer is designed by ourselves dedicated to our amp design (and custom made by Hashimoto Co of Tokyo in best audio grade standard) to handle the extra power on this design, special attention is paid to operating temperature and quietness to the refinement level we wanted, along with the tube's durability. There are also the dual individualized stages premium power supply electrolytic capacitors setup (e-cap here and after) for separated superior power delivery to the tubes (1st e-cap) and amplifier gain stages (2nd e-caps) separately— featuring high-end Mundorf “M-Lytic” capacitors. Then the dual Hashimoto high-end potted choke transformers are being setup for superior AC filtering for each/different sections, separately, which almost like double the power of filtering. One of the choke is in place to feed the tubes and its dedicated power supply. The second Hashimoto choke transformer is served to feed the dual e-caps, feeding the rest of the power supply stages. While with the set same of transformers setup, we can make the amplifier to pump out 18 or more watts. We decided to keep it lower at 16W with lower distortion and more refined sound reproduction with longer life expectancy on the 300Bs. Our money-no-object takes on the 300B tube!